Reformed rock band The Police are to headline the 2008 Isle of Wight Festival, organisers have announced. The group, fronted by Sting, will top the bill on Sunday 15 June, closing the three-day festival. "It's a coup to get The Police," said promoter John Giddings. "We're very happy to have the biggest tour of the last two years stopping by." Famous for hits like Roxanne and Every Breath You Take, The Police announced they were reforming in January. After a successful performance at the Grammy awards, the group confirmed they were to set out on a world tour. The live reunion has recently been named the top-grossing and top-selling worldwide tour of 2007 by Billboard magazine. More dates are scheduled for next year, with the band heading for New Zealand, Australia and Japan before returning to Europe in June. 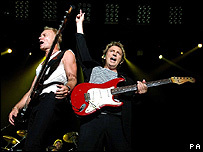 According to organisers, the trio's Isle of Wight date will be their only UK festival appearance in 2008. Tickets will be on sale from 10 December.